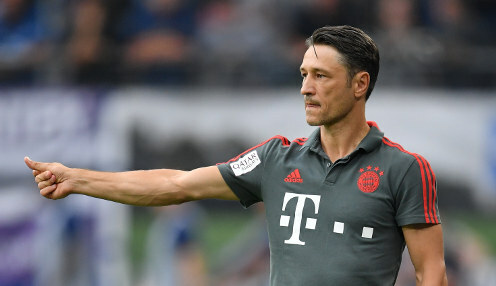 Niko Kovac is the man in charge at Bayern Munich this season. Germany midfielder Leon Goretzka is already content that he made the right decision to leave Schalke to link up with Bayern Munich this summer. The 23-year-old schemer turned down the offer of a new contract in Gelsenkirchen to head to the Allianz Arena, where he has helped Bayern win their opening two Bundesliga games - scoring his first goal for the club in the 3-0 win at Stuttgart last time out. The decision to move to Bayern Munich was the next step in my career. And Goretzka is pleased with the way things have gone with his new club, while also thanking Schalke for their approach to his exit. He told the Frankfurter Allgemeine Sonntagszeitung: "The decision to move to Bayern Munich was the next step in my career. "I decided consciously to move to an environment where I could develop further and where I think I've probably already improved. "There was a lot of negativity about the amount of time it took me to make my mind up, but I'm grateful to Schalke for giving me this time and not putting me under any pressure. "You can only make such a decision perfectly when you take enough time and that is what I did, until I reached the decision that this was the best place for me. I am 100 per cent convinced of this." Goretzka started for his country in their recent goalless draw against France in the UEFA Nations League, but was an unused substitute for the 2-1 friendly win over Peru on Sunday. Germany are available at 7/1 to win Euro 2020, with World Cup 2018 winners France 10/3 and Spain priced at 11/2.